I have had my dingo-labrador cross, Snowy Moriarty, for 6 and a half years but have only recently taken him for his first photobooth shoot. When I was a puppy raiser for the Guide Dog Association, it was much easier to slip into a booth with a pup, as they were allowed into any store or shopping complex. Smuggling a 30 kilogram dog into a forbidden area takes some guts and determination! One has to admit posing for a camera, in a confined space, with frequent whispered admonitions to “be quiet”, “sit still” and “cooperate!” is not a dog’s favourite pass-time. Having bravely suffered the experience in two old chemical booths, Snowy said he would not do it again unless I could find a booth that was working properly. Everyone’s a critic!! On our way home we stopped at a digital machine. He was much happier with those results! Katherine, you are one of those lucky women who gets prettier with age. You have the bestest way of making me smile! I love the picture 2nd one down on the left in the regular photobooth where the clever Moriarty has supplied you with a Sherlock-esqe moustache. He has obviously poked out his tongue so no-one would recognise him. You done it again Holmes! Yup, he is my beauty nemesis. Fresh mascara licked off within minutes and moustaches. Gotta love my doggy! Love these pictures, Katherine, especially the non-digital ones. Have a wonderful Christmas and a great New Year when it comes. Thanks Jean. Happy New Year! 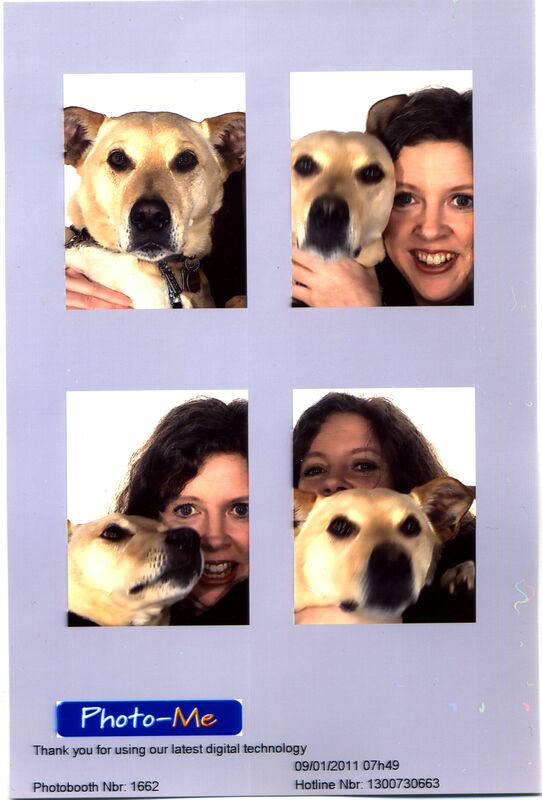 How impressive that you got your dog into a photo booth! 😉 I don’t think mine would allow it (assuming I managed to get her into a mall)…perhaps if there was really good food there. Hope you are having a great holiday, Katherine, happy new year! I missed these before. What a dog! And, in the digital version, lower left, I can almost tell what you are saying to calm things down, though not quite. He hated the digital booth more than the chemical ones. The space is a lot more cramped. He was just sick of being manhandled, too, I guess. I love him! My cats would never manage a Booth.